I separated the circuit board layout decals into sections then cut and fit them to the hutch and hutch cabinets with painters tape until I had them exactly where I wanted them. I centered the decals using blue painters tape so it wouldn’t leave a residue on the new paint finish. Once the backing is removed from large decals always make sure to align them exactly before applying them. Then place one edge while working your way outward using a driver’s license or credit card and holding the tail outward. Once applied patiently work all of the wrinkles and air bubbles out of the vinyl. Remove the top layer slowly while pulling as close to the decal as possible. With all vinyl decals in place I decided that I also needed larger ROG logos on the desk to make it match the ROG Air 240 even further. I had previously purchased a couple sections of vinyl in red and black from eBay for $10 and used these for the large ROG decals. I printed out the ROG eye off of my inkjet print in the size I wanted on card stock. I then cut the image out using an X-acto knife, painters tape and patients creating a ROG stencil. Then I taped the vinyl securely in place to a cardboard box and taped the stencil over the vinyl. Then with about 10 minutes of slow cuts I had a 4” ROG logo. 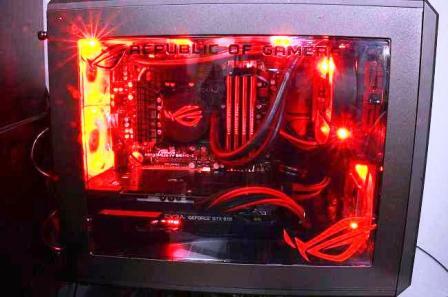 Repeated this until I had the 3 ROG logos and applied them the same as I had for the circuit board decals and previous ROG decals.